Welcome back to DC Students! September is National Campus Fire Safety month with more than 28 states – and the District of Columbia – issuing proclamations to help bring awareness to unsafe conditions and activities on and off campus. Five people died in the 2009-2010 academic year, continuing a downward trend that is good news. All of the fatalities occurred in off-campus housing which is where over 80% of the 140 fire deaths since 2000 have occurred. 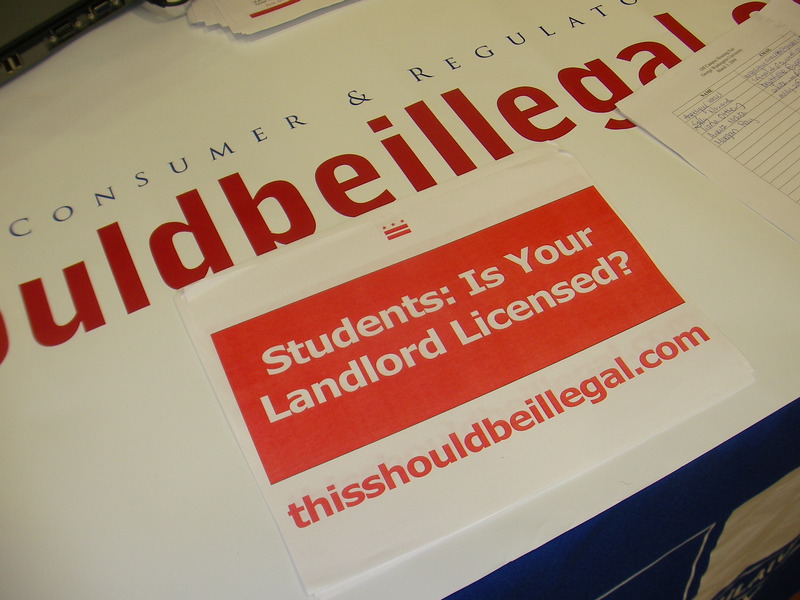 The Department of Consumer and Regulatory Affairs started this blog and our outreach efforts in 2008 to bring awareness not only to fire safety issues in college housing, but also other building issues and violations that can affect the health of students. We know some of you may be hesitant to call the government to have an inspection or to report your landlord. We know this is a difficult decision. And while we highly recommend you see if your landlord has a license (put in your address and you click on licensing) and report any code violations, we have published the list of items our inspectors look for during a basic safety inspection. You need to ask your landlord some tough questions if you see things that don’t look quite right. If you don’t get the response you were hoping for, contact us if you need help. More contact information is to the left. We encourage EVERYONE, student or not, to use this information to learn your rights, understand the rules. Please contact us at anytime to get answers to your questions or call 202-442-9557 to schedule an inspection if you have issues with your apartment or home. And do an inspection yourself from time to time, even if your property is licensed. 1) If I decide to leave, can he charge me with breaking the lease if he’s not licensed in the first place? 2) What procedure would I have to follow to get my rent back? You need to call 202-442-9557 or email dcra.housingcomplaints@dc.gov and schedule a housing inspection and he’ll had to make the repairs. We don’t get involved with leases unfortunately. But you can speak with the Office of the Tenant Advocate at ota.dc.gov. Thanks!